Secaucus, NJ (September 2, 2009) – Today, Panasonic announced the new LUMIX DMC-GF1, the latest addition to the award-winning LUMIX G Series, which debuts as the world’s smallest and lightest system digital camera with a built-in flash*. The LUMIX DMC-GF1 distinguishes itself from previous models with its elegant, compact design reminiscent of classic film cameras, yet builds on Panasonic’s success with the revolutionary LUMIX G Series of digital interchangeable lens system cameras based on the Micro Four Thirds system standard. With its compact size, user-friendly design and ability to record High Definition (HD) video and take professional-quality photos, the LUMIX GF1 continues to redefine digital photography standards. With its lightweight body, the LUMIX GF1 provides experienced photographers with the ideal digital camera to carry with them at all times. Like its predecessors in the LUMIX G Series, the LUMIX GF1 eliminates the pentaprism found in traditional interchangeable lens cameras. Thus, this mirror-free structure allows Panasonic to dramatically reduce both size and weight. Though small in size, the LUMIX GF1 does not compromise in advanced features. The LUMIX GF1 thoroughly optimizes the advantages of a system camera to ensure high performance, whether capturing photos or HD video. The LUMIX DMC-GF1 can record 1280 x 720 High Definition video in AVCHD Lite, a format that enables longer recording times. With a dedicated video record button, capturing video is convenient and easy. The LUMIX GF1 can also record HD Motion JPEG in 1280 x 720 and other video recording formats include: QVGA, VGA and WVGA. The LUMIX GF1 has a unique Movie Program Mode that allows consumers to adjust the depth-of-field while shooting in HD video, so background and foreground can be blurred to give creative effects – something typically only possible with expensive professional camcorders. The LUMIX DMC-GF1 includes the new My Color mode, which includes seven preset effects – Expressive, Retro, Pure, Elegant, Monochrome, Dynamic Art, Silhouette and Custom – all which let users manually set the color, brightness and saturation levels. With the Live View function, users can see how these settings will effect the photo before they shoot, making it easier to capture the exact mood or atmosphere desired. For even more elaborate effects, users can choose from a total of nine Film modes, and set the contrast, sharpness and saturation levels for each. A custom function lets users store their favorite settings in memory. Furthermore, the exposure meter can be displayed in other shooting modes and the correlation between shutter speed and aperture is shown, with a color-coded warning that alerts users when the settings are not in the proper range. For those users not quite comfortable with extensive manual and creative controls, the LUMIX GF1 provides a user-friendly setting that can address a beginner’s comfort level, while helping them evolve their photography skills. For instance, Panasonic’s new Scene mode, Peripheral Defocus, lets users take a photo where the foreground is in focus and background is blurred – or vice versa. This popular effect can be intimidating for a beginner, but in the Peripheral Defocus mode, by simply selecting the objects to be blurred and focused using the camera’s keypad, it is simple for photographers of any level. 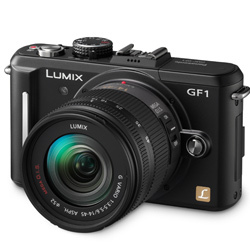 Also, helping to make the LUMIX GF1 more approachable, Panasonic’s popular iA (Intelligent Auto) mode, a system of technologies that engage automatically – no setting changes needed – allows for intuitive use when shooting still or video images. While shooting video, iA activates Panasonic’s O.I.S. (Optical Image Stabilization), which helps reduce video-blurring due to handshake. In addition, Face Detection automatically detects a face in the frame and adjusts focus, exposure, contrast, and skin complexion on it so it always turns out beautifully. Intelligent Exposure continually checks the ambient light level and adjusts the exposure setting as conditions change to prevent blown highlights and blocked shadows. For still photos, the iA system encompasses: Face Recognition (up to six faces can be registered); Auto Focus (AF) Tracking; Mega O.I.S. ; Intelligent ISO; Intelligent Exposure; and Intelligent Scene Selector. The LUMIX GF1 also comes fully-equipped with a built-in flash and a large, 3.0-inch Intelligent LCD with a wide viewing angle and a 460,000-dot resolution. The Intelligent LCD offers automatic backlight control, which when combined with its high-resolution, helps improve visibility in all light environments – from sunny outdoors to low-light interior settings. New for the LUMIX G Series, the LUMIX GF1 is compatible with an optional Live View Finder (DMW-LVF1), which provides the full-time live view function boasting 100% field of view regardless of the attached lens. To further expand the LUMIX G Series system, Panasonic Micro Four Thirds digital cameras can be used with Four Thirds System interchangeable lenses via an optional mount adaptor DMW-MA1 and with the prestigious Leica M/R lenses using Panasonic’s DMW-MA2M DMW-MA3R. These adapters give the user access to the unlimited number of lens properties. The LUMIX GF1’s sensor technology offers the best of both worlds - the superior image quality of a CCD sensor, and the low-power consumption of a CMOS sensor. Advanced technology makes it possible to read four channels of data simultaneously, helping the LUMIX GF1 deliver 60 frames-per-second full-time Live View images, while maintaining fine detail and rich gradation. The LUMIX GF1’s Venus Engine HD records stunning high-resolution 12-megapixel images using its advanced Live MOS Sensor. This sophisticated LSI circuit separates chromatic noise from luminance noise and applies the optimal noise reduction to each, helping to capture clear and beautiful images even when shooting at high ISO levels. The contrast AF system adopted in the LUMIX GF1 is not only accurate, but also very quick – approximately 0.3 seconds with the LUMIX G H-FS014045 lens. Users can choose from a wide-range of AF modes, including multiple-area AF with up to 23 focus areas; 1-area AF with a selectable focus area; Face Detection; and AF Tracking. The LUMIX GF1 also has a Quick AF function that begins focusing as soon as the user aims the camera - without pressing the shutter button halfway. As with all Panasonic LUMIX G Series digital cameras, the LUMIX GF1 is equipped with a highly-effective Dust Reduction system. Thus, if dust gets inside the camera (when changing lenses), Panasonic’s Dust Reduction system addresses this problem by placing a supersonic wave filter in front of the Live MOS sensor which vertically vibrates around 50,000 times per second, thus repelling the dust. The content captured on the LUMIX GF1 can easily be viewed on a Panasonic VIERA® HDTV by simply inserting the SD/SDCH Memory Card into the VIERA’s SD/SDHC Memory Card slot or into a Panasonic DIGA Blu-ray Disc Player. Alternatively, an optional mini HDMI cable can be used to output still and motion images recorded with the LUMIX DMC-GF1 directly to the TV for easy VIERA Link™ operation, with control of playback functions, such as slideshows, managed from the VIERA HDTV’s remote control. The Panasonic LUMIX DMC-GF1 will be available in early October 2009 with the option of two kits – both with a suggested retail price (SRP) of $899.95. One kit option includes the newly-announced LUMIX G 20mm/F1.7 ASPH, a compact and lightweight “pancake” lens, while the other kit features the LUMIX G VARIO 14-45mm/F3.5-5.6 ASPH/MEGA O.I.S. The optional Live View Finder DMW-LVF1 has an SRP of $199.95; while the DMW-MA2M and DMW-MA3R both have an SRP of $249.95. All new accessories will also be available in early October. For more information about Panasonic and its LUMIX G System cameras and accessories, please visit www.panasonic.com/lumix. •Panasonic in-house comparison. The speed may vary depending on the specifications of PC and the number of images stored in the PC and other condition. •AVCHD Lite motion images recorded onto an SD Memory Card or a DVD cannot be played on a device that does not support the AVCHD standard. •Some video recording functions may not be available depending on the lens that is mounted. •When setting quality to HD, WVGA or VGA, Panasonic recommends using a high-speed card with "10MB/s" or greater displayed on the package. •Continuous recording exceeding 2GB is not possible when recording motion JPEG. Remaining time for continuous recording is displayed on the screen. •AVCHD Lite motion images recorded onto an SD Memory Card or a DVD disc cannot be played from a device that does not support the AVCHD standard. •Turn Face Recognition item ON and register the person with full-face portrait on the shooting menu in advance. Refer to back page for detail. •Some functions in iA mode may not be available depending on the lens that is mounted. • Lenses that are not compatible with the contrast AF function can be used with manual focusing. •There are some limitations to other functions depending on the lens to attach. Based in Secaucus, N.J., Panasonic Consumer Electronics Company is a Division of Panasonic Corporation of North America, the principal North American subsidiary of Panasonic Corporation. (NYSE: PC) and the hub of Panasonic's U.S. marketing, sales, service and R&D operations. In its commitment to provide consumers with extensive imaging resources, Panasonic LUMIX established the Digital Photo Academy, a series of nationwide workshops designed to instruct consumers how to optimize the features on their digital cameras and produce high-quality photos. Panasonic is honored to support OUR PLACE – The World’s Heritage, a project that will create the world’s largest photographic collection of UNESCO World Heritage sites, with acclaimed photographers exclusively using LUMIX digital cameras to capture all images. This entry was posted in Panasonic and tagged Panasonic GF1. Bookmark the permalink. Trackbacks are closed, but you can post a comment.